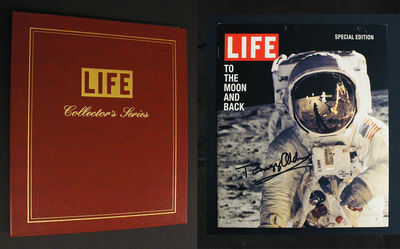 Offered here is an extremely scarce Limited Edition Life Magazine featuring the historic Apollo 11 moon mission which has been signed by Buzz Aldrin, the second man to walk on the moon! This magazine is housed in a custom Life Collectors Series binder and comes with a COA attesting to authenticity. Condition overall is excellent with beautiful coloring all around, but there are few small white marks visible at the top of the magazine and a round discoloration inside the binder.